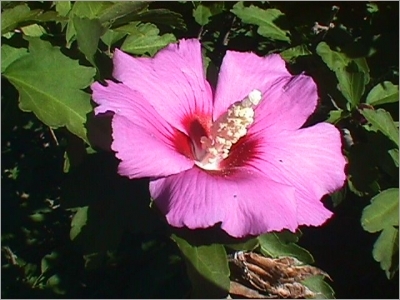 Hibiscus syriacus, the common garden Hibiscus is also called Rose of Sharon. 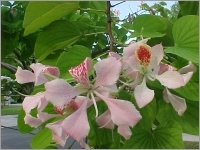 It is a flowering shrub native to much of Asia. It is vase-shaped, reaching 2-4 meters in height. Hibiscus syriacus is the national flower of South Korea. 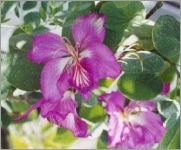 The flowers come in several colors, including white, pink, purple, blue, red or bicolors, with a different colored throat, depending upon cultivar. Continuous blooms often occur from July through September. The flowers can reach 2-4 inches in diameter. The flowers are hermaphrodite, they have both male and female organs. Plants are late coming into leaf, usually around the end of May or early June. The foliage is deciduous. The leaves are 2-4 inches long, they have three distinct lobes with sparsely dentate margins, and are medium to dark green. Fruits green to brown capsule 0.75' long. The trunk is white-gray and relatively smooth, branching very near to the ground unless limbed up into tree form. Since plants bloom on new growth, shaping or pruning can be done at any time; prune in late Winter or early Spring in northern climates.